Qi: The life force in your body. Qigong: The practice involving the mind, breath and movement. Yin and yang: The opposing elements of the universe. Tai chi helps you balance these elements. People reference tai chi as “meditation in motion” because of the mental benefits. There are three main styles of tai chi, according to the Tai Chi for Health Institute. These styles are Yang, Wu and Sun. Other varieties may take different aspects from all of these for an entirely new experience. Mental: Decreased chances of stress, anxiety and depression, elevated mood and well-being. Physical: Increased aerobic capacity, energy, stamina, flexibility, balance and muscle strength. 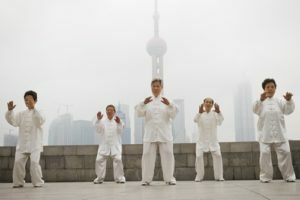 There is even speculation that a tai chi regimen can improve sleep, joint pain and the immune system function, as well as help with heart conditions like blood pressure and symptoms of congestive heart failure. However, it’s important to not rely solely on tai chi to help treat these conditions and speak to your doctor before beginning a martial arts regimen. Harvard Medical School also pointed out that even though tai chi has a set range of motions, it can still be adapted for anyone, even if you’re in a wheelchair or recovering from surgery in your leg, shoulder or anywhere else. The great thing about tai chi is the fact that you can do it on your own or in a class. You’ll have a better chance of reaping the benefits of the activity if you begin an ongoing routine than just taking a class once in a while, or ceasing the activity after your classes have come to an end. One way to learn is to take a class that teaches you the basics of tai chi and then practice at home. You can also take different classes that focus on the different styles to find which one is best for you.